By 2040, the world's power-generating capacity mix will have transformed: from today's system composed of two-thirds fossil fuels to one with 56% from zero-emission energy sources. Renewables will command just under 60% of the 9,786GW of new generating capacity installed over the next 25 years, and two-thirds of the $12.2 trillion of investment. • Economics – rather than policy – will increasingly drive the uptake of renewable technologies. All-in project costs for wind will come down by an average of 32% and solar 48% by 2040 due to steep experience curves and improved financing. Wind is already the cheapest form of new power generation capacity in Europe, Australia and Brazil and by 2026 it will be the least-cost option almost universally, with utility-scale PV likely to take that mantle by 2030. 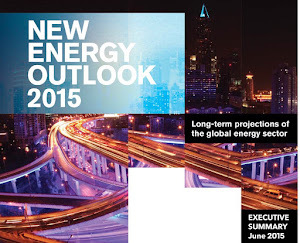 • Over 54% of power capacity in OECD countries will be renewable energy capacity in 2040 – from a third in 2014. Developed countries are rapidly shifting from traditional centralised systems to more flexible and decentralised ones that are significantly less carbon-intensive. With about 882GW added over the next 25 years, small-scale PV will dominate both additions and installed capacity in the OECD, shifting the focus of the value chain to consumers and offering new opportunities for market share. • In contrast, developing non-OECD countries will build 287GW a year to satisfy demand spurred by economic growth and rising electrification. This will require around $370bn of investment a year, or 80% of investment in power capacity worldwide. In total, developing countries will build nearly three times as much new capacity as developed nations, at 7,460GW – of which around half will be renewables. Coal and utility-scale PV will be neck and neck for additions as power-hungry countries use their low-cost domestic fossil-fuel reserves in the absence of strict pollution regulations. • Solar will boom worldwide, accounting for 35% (3,429GW) of capacity additions and nearly a third ($3.7 trillion) of global investment, split evenly between small- and utility-scale installations: large-scale plants will increasingly out-compete wind, gas and coal in sunny locations, with a sustained boom post 2020 in developing countries, making it the number one sector in terms of capacity additions over the next 25 years. • The real solar revolution will be on rooftops, driven by high residential and commercial power prices, and the availability of residential storage in some countries. Small-scale rooftop installations will reach socket parity in all major economies and provide a cheap substitute for diesel generation for those living outside the existing grid network in developing countries. By 2040, just under 13% of global generating capacity will be small-scale PV, though in some countries this share will be significantly higher. • In industrialised economies, the link between economic growth and electricity consumption appears to be weakening. Power use fell with the financial crisis but has not bounced back strongly in the OECD as a whole, even as economic growth returned. This trend reflects an ongoing shift to services, consumers responding to high energy prices and improvements in energy efficiency. 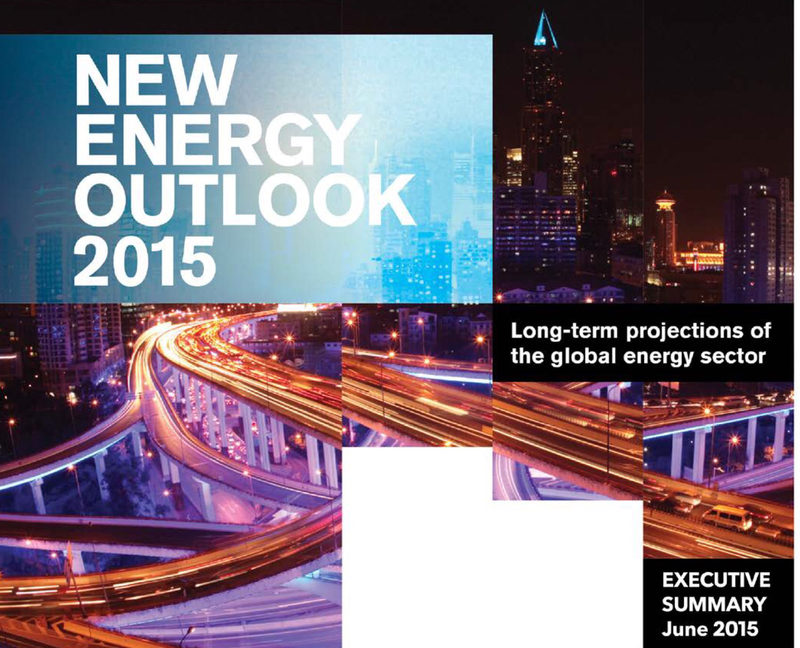 In OECD countries, power demand will be lower in 2040 than in 2014. 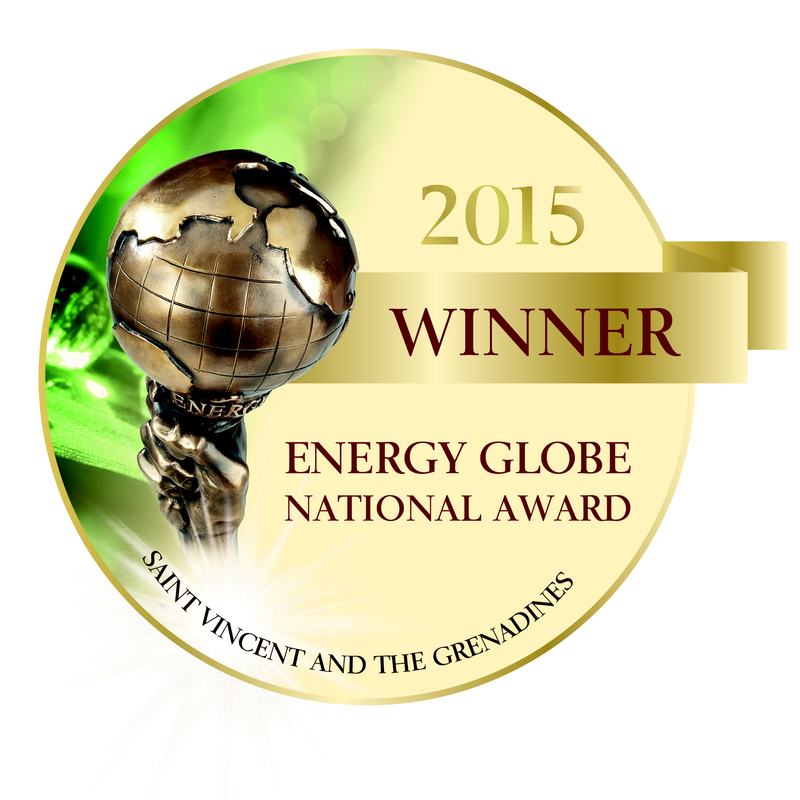 The Caribbean Community Climate Change Centre (CCCCC) received the 2015 Energy Globe Award for its renewable energy and potable water work in Saint Vincent and the Grenadines. Energy Globe, an internationally recognized trademark for sustainability, is one of the most important environmental prizes today with 177 participating countries. The award, which is made from a cross-section of over 1, 500 entries annually, is given in recognition of outstanding performance in terms of energy efficiency, renewable energy and resource conservation. The CCCCC won the 2015 Energy Globe National Award for the project “Special Programme for Adaptation to Climate Change”. 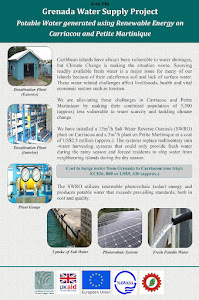 The project was executed on the island of Bequia in Saint Vincent and the Grenadines and focuses on the production and provision of clean drinking water for more than 1,000 people. 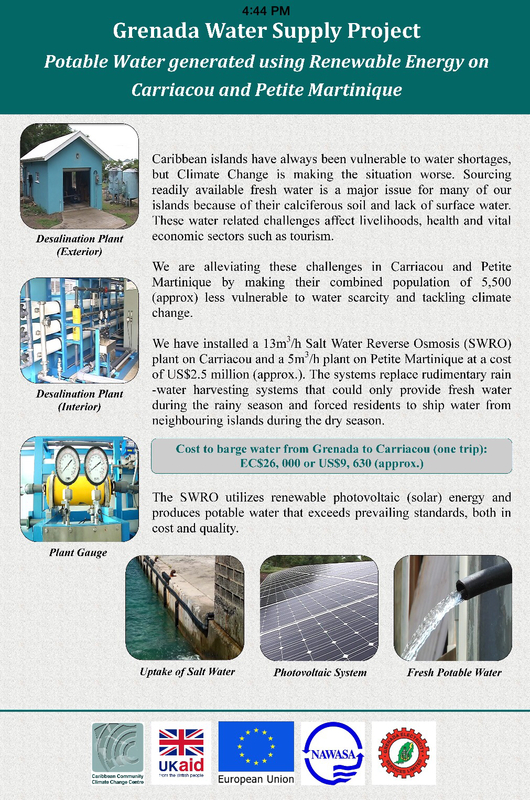 This is being done through the acquisition and installation of a reverse osmosis desalination plant. The project is deemed highly sustainable as the water input is inexhaustible sea water and the energy used is solar, a renewable, carbon-free source. The landmark project was also presented by Energy Globe as part of a global online campaign (www.energyglobe.info) on World Environment Day. The campaign ran under the patronage of UNESCO and in cooperation with UNEP and received significant recognition. Secretary-General Ban Ki-moon My main message to you is to remain fully engaged and keep working with us to strengthen our partnership during this vital year for humanity. 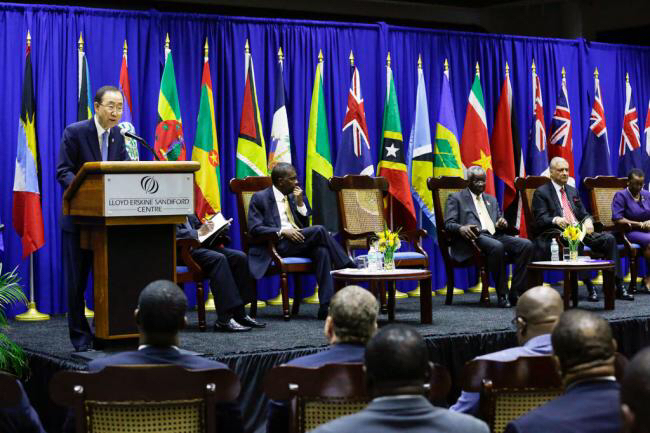 Together, we can build a better, more sustainable world, for all.said during a high-level symposium focused on sustainable development in the Caribbean. This meeting was among the UN chief’s first stops in Barbados, where later on Thursdayhe is expected to make opening remarks to the 2015 Caribbean Community (CARICOM) Summit, and where tomorrow, he will, among others, hold an interactive dialogue at the University of the West Indies. Encouraged by the presence of so many leaders of governments, regional and international organizations, the private sector, academia, and civil society, the Secretary-General highlighted the “continuing Caribbean commitment to put our world on a safer, more sustainable and equitable pathway,” a few days from theThird International Conference on Financing for Development in Addis Ababa, Ethiopia. “As leaders of some of the most vulnerable countries in the world, you don’t need to be told that our planet is at grave risk. You are on the climate frontlines. You see it every day,” he continued. Considering these goals as a sort of a “to-do list for people and the planet”, Ban emphasized that it will take partnerships to make that happen. In that regard, he said, the Third International Conference on Small Islands Developing States in Samoa last year laid a pathway for collective action and success within the post-2015 development agenda. But, as the world prepares for a new sustainability framework and the sustainable development goals, a number of critical partnership areas must be strengthened, in particular the need for capacity building; financing; access to technology; and improved data collection and statistics. Member States also must continue working together to link the global agenda to regional agendas and to deepen regional integration and to address the “unique needs and vulnerabilities” of small island developing states and middle-income countries, such as the debt challenge. “And we need to keep forging the way forward towards a low-carbon, climate-resilient development pathway that will benefit both people and the planet,” the Secretary-General underlined. He gave the assurance that, through the Green Climate Fund, and in working with world leaders, he will continue to insist that small islands and least developed countries are top funding priorities. Later, in an address to an event on ending violence against women, the Secretary-General said the Caribbean has among the highest rates of sexual assault in the world. Three Caribbean countries are in the global top ten for recorded rapes. Moreover, he noted that in the eastern Caribbean, UNICEF estimates that child sexual abuse rates are between 20 and 45 per cent – meaning at least one in five precious children are affected. Most are girls who have no choice but to live close to their attacker. “They desperately need our help. Too many women are afraid to seek help. One study showed that up to two thirds of all victims suffer without ever reporting the crime. I am outraged by this. Shame belongs to the perpetrators – not the victiWe have to change mindsets – especially among men,” declared the UN chief. In that light, he said he was proud to be the first man to sign onto the UN’s HeForShecampaign, and he invited more men to take the HeForShe pledge. In the photo: Glaciologist Jason Box, left, at work on the Petermann Glacier on Greenland’s northwest coast, which has lost mass at an accelerated pace in recent years. Box and his family left Ohio State for Europe a couple years ago, and he is relieved to have escaped America’s culture of climate-change denial. 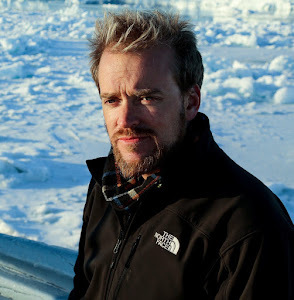 CLIMATOLOGIST: METHANE PLUMES FROM THE ARCTIC MEAN WE’RE SCREWED. 2 July 2015: The International Renewable Energy Agency (IRENA) has released Renewables Readiness Assessments (RRAs) for three small island developing States (SIDS): Fiji, the Marshall Islands and Vanuatu. The RRAs find that the three countries could meet their energy needs, expand energy access, decrease electricity costs and strengthen energy independence through a combination of renewable energy resources. The Assessments call for employing a combination of solar, wind, geothermal, marine, biomass and biofuel energy to lessen the islands’ dependence on imports and cushion their economies from oil price fluctuations. They find that developing domestic sources of renewable power will be a win-win for both the climate and the economy, mitigating these countries’ carbon emissions and creating local jobs. As outlined in their RRAs, all three countries are heavily dependent on fossil fuel imports, despite abundant renewable sources: solar, geothermal, wind, biomass and biofuel in Vanuatu; solar and wind in the Marshall Islands; and hydropower, biomass, solar, geothermal and wind in Fiji. The RRA for Vanuatu assesses progress under the National Energy Roadmap toward sourcing 63% of its energy from renewables by 2030, calling for a grid-assessment study in preparation for large-scale renewables integration. Concluding that off-grid renewables could reach 83% of rural residents without electricity, it also recommends adoption of standard designs for off-grid solar-home systems. The RRA for the Marshall Islands reports thousands of solar installations since enactment of the National Energy Policy and the Energy Action Plan, but suggests exploring more wind opportunities, forming a national energy agency and a renewable energy coordination committee, planning for off-grid renewables and addressing fuel drum leakage. The RRA for Fiji examines the National Energy Policy, which hopes to achieve 100% renewables by 2030, finding that the Policy requires further implementation. It calls for a national energy committee to improve coordination among ministries and donors, consideration of maritime transport fueled by renewables, and greater geothermal energy exploration. The JetBlue Foundation is offering two scholarships for students to attend the Centre for Responsible Travel (CREST) and the Puntacana Ecological Foundation’s Innovators Think Tank. This is a unique opportunity for students to learn about key issues involving climate change and tourism. Applications will be due July 10th and a decision will be made by July 13th. CREST will be handling applications.